Since day 1, backlinks have been an integral part of optimizing websites and web pages for search engines. In fact, following links to web pages was a major factor in Google’s rise to the top of the search heap. In the years since, links, and the value passed by links from one page to another have become the single most important off-page SEO ranking factor. The way links impact rankings have also evolved over time. Formerly, simply have a ton of links pointing at a page was enough to make it rank at the top of SERPs. However, thanks to updates by Google, generally (but not always) known as the Penguin algorithm, have changed the emphasis from quantity to quality when it comes to backlinks. In search engine optimization, a quality backlink refers to a dofollow backlink within the body text of a page on a high-quality website that is relevant to your topic that points to a page on your website. The highest quality backlinks use relevant keywords within the anchor text of the links. Keep in mind, though, that backlink quality is evaluated on a spectrum, not a binary. So a link can be high quality without having all of those qualities. In fact, it’s really quite rare for your site to have a link that meets more than just a couple of criteria. Link quality matters because it determines how much link juice it passes to your page. Back in the early days, looking at the number of links pointing to a page was really helpful when Google was trying to decide the best pages to show in search results. However, using the number of links left this system vulnerable to manipulation by less than scrupulous SEOs. To prevent this manipulation, Google introduced its Penguin update to penalize sites it determined were using link schemes. The Penguin algorithm punishes link schemes and devalues low-quality links. So while backlinks are still very important (possibly 1 of the top 3 ranking factors), the focus is now definitely on quality over quantity. What Makes a Link High Quality? Backlink quality needs to be evaluated both on an individual level and as part of your site’s overall backlink profile. Unfortunately, there are no hard and fast rules regarding how you must evaluate each link by those criteria. Instead, you have to look at the quality of each link individually and in the context of your site’s overall link profile. Anchor text refers to the clickable text of a link — usually, it’s blue and underlined. When Google crawls a web page and finds a link, it uses the anchor text as a way to determine how and if the destination URL is relevant to the linking page. On an individual basis, the ideal link will use anchor text that uses a page’s target keyword in a way that is natural and relevant to the linking page. So if there’s an article about gardening linking to a page selling trowels, an ideal anchor text would include the word "trowel", “spade”, “shovel”, “gardening tools” or something along those lines. Anchor text should also be relevant to the content of the linking page. A link to our garden trowel page using "spade" as the anchor text is highly relevant to that page. But if the linking page is about speakers, that’s a low-quality backlink. This commonly happens on dubious pages about gambling or less-than-legitimate prescription drugs. While backlinks using keyword-rich anchor text will be some of your most valuable links, having a link profile with nothing but keyword anchor text will likely end up hurting you more than helping. Generic phrases like "click here" or “this page”. Sites that have been around for a while will naturally acquire links with a wide variety of anchor texts. When examining the quality of your overall link portfolio, take an especially close look for those that use the anchor text and text surrounding the links. 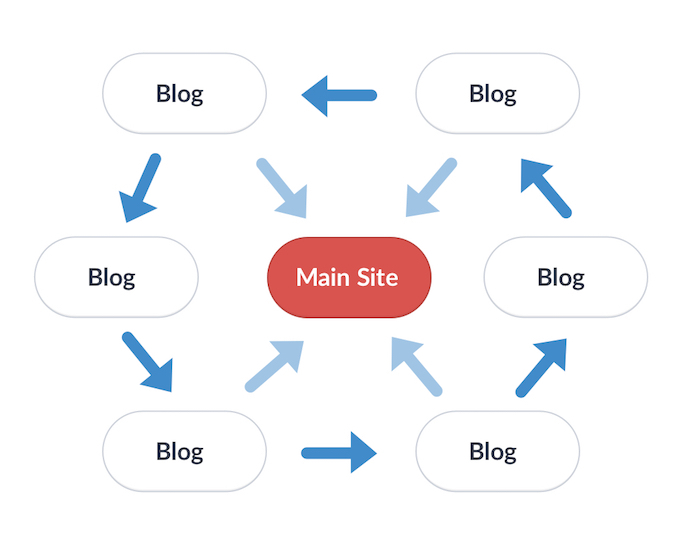 Blackhat SEO services and negative SEO attempts will often automate their link building efforts, which will result in hundreds or thousands (or more!) links with the same anchor text and surrounding text. We covered this briefly in the section about anchor text, but overall page relevance is also very important in determining link quality. Links from high-quality pages with content that’s relevant to your page is going to pass a lot more link juice than a link from an irrelevant and/or lower quality page. How that page fits into the overall domain also plays a factor in how much link juice it passes through backlinks. Orphan pages (those with no internal links pointing to them) won’t be as valuable as non-orphan pages because they won’t pass any of the domain’s accumulated value. Unfortunately, deciding whether or not a linking page or domain is "quality" can be subjective. There are plenty of tools out there you can use — Moz, Ahrefs, Majestic — or you can do it yourself. Does the topic of the page match the topic or niche of the overall website? This will depend heavily on website niche, so use your best judgment. Unrelated pages on a news site are obviously not an issue, but a page about online poker on a local food blog is a red flag. How aggressively is the content monetized? Some ads on the page are fine — publishes have to eat, too — but they shouldn’t detract from the user’s ability to read or watch the content. Articles full of affiliate links should warn you off. Is the site owner actually trying to help users? Quality content is published with the objective of actually providing value to a visitor, which is pretty difficult to do with thin, over optimized and/or scraped content. A link from a page like that, or a site full of those types of pages, won’t be very high quality. Do a lot of your links come from the same IP address? There’s no IP address or addresses that is a sign of a bad link. However, having lots of links coming from multiple domains with the same IP address is a big warning sign of a private blog network, which Google hates. You should also look out for IP addresses from spam-heavy countries like Russia, China or India if your business doesn’t operate there. Is it a unique domain? This ties in a little bit with IP address — at least the principle is the same. The value of a single backlink diminishes as you acquire more links from a particular domain. This doesn’t mean a link from a domain that already links to you is bad or worthless. Just that new domains will pass more link juice. How "far away" is the linking domain from Google’s trusted seed sites? Google has a set group of websites that it trusts and then assigns trust and authority to domains based on how many links you have to follow from a seed page to get to the linking page. So, for example, a backlink from a page that is linked to by Wikipedia will be a lot more valuable than a link from a page that is 10 or 20 links away from Wikipedia. Every link on a page distributes a portion of that page’s link juice, but not all links on a page send the same amount of value. Where the link appears on a page will greatly influence how valuable it is for your SEO purposes. Each of those sections can, and often do, contain external links that pass link juice to their destination page. However, only links that appear within the body content of a page should be considered valuable to your SEO and safe from changes in Google’s algorithms. The location of a link in body content will also play a large factor in how much link juice it passes. The higher up a page a link appears, the more important it is to the content of the page and more valuable it is to the reader. Therefore, those links will pass more value than links that occur lower in the article. A link’s location in relation to other links will also influence its value to your SEO. The amount of link juice passed by a link is equal to a page’s total link juice divided by the total number of links on a page. Including all nofollow links (learn how nofollow links impact the flow of link juice). Therefore, a page with a ton of links is obviously going to pass less value than a link on a page with fewer links. So, theoretically, a link in the first paragraph of a page could pass less value than a link at the bottom of a page that has a lot fewer links. Plus, a page with a lot of external links (200 or more generally) could look like a page that exists solely to sell backlinks, which will do more harm than good for SEO. Finally, the links that appear surrounding the link to your page also impact its SEO value. Imagine a page links to your page in a list that also includes links to Wikipedia, the Library of Congress and CNN it will have more value than a link that appears alongside lower quality sites. This is an easy thing to forget when evaluating the SEO value of links, but remember that backlinks also send referral traffic to your website. This won’t benefit your SEO all that much but still contributes to your overall marketing performance. Pitching a guest blog post is a great way to not only acquire a link from a high-quality domain. Guest blogging has the benefit of giving you control over the content’s top as well as the anchor text of your backlink. Just be careful to not overdo guest blogging, as it can give you an unnatural-looking link profile. Add links to your content in existing articles. Send an email to the website owner explaining how your content would add context, important background or otherwise benefit the reader. Whichever method you use, acquiring quality backlinks requires creating high quality, useful content for people to link to. Learn more about building high-quality backlinks. The next step is to conduct what's known as a link audit. Link audits are the process of collecting data about your site's backlinks and evaluating them for quality.